As this year’s McDermott Interns wind down their time with us here at the Museum, I wanted take a moment to look back at all they’ve accomplished over the past eight + months–A LOT! Each has researched works in our collection and presented a bite of insight over the lunch hour for our adult visitors during Gallery Talks. Our final intern talk will be this Wednesday at 12:15 pm with Marta–don’t miss it! They’ve written clever, informative posts on both of our blogs, Canvas and Uncrated. Angela even started a video series to give us a more in depth peek into intern life here at the Museum. They’ve utilized their professional development funding to attend conferences, meet with colleagues, visit museums, and learn about opportunities for their future across the U.S., from L.A. to St. Louis to Maryland and beyond. Grace and Angela shared their experiences with us on here on Canvas as well. Not only have they contributed countless hours of research toward the DMA collection, future exhibitions, and program planning, but they’ve also produced some exciting activities you can check out right now! Amy curated Multiple Selves, a small exhibition of works on paper which can be found in our Level 2 European Galleries, and Sara devised the plot for our upcoming Museum Murder Mystery. These are just a few examples–the whole list of each of their contributions would be much too long for one post! And of course, they had some fun visiting artworks and collections across the Metroplex! With plans to head off to grad school, embark on careers in museums and the arts, or even help us here at the DMA through the summer, we know these lovely ladies will see much success in their futures. We sure will miss them but are so excited to find out all the places they’ll go! When you find yourself in a room with Rose Davis, it is clear that she is not someone who goes unnoticed. She is warm and charismatic, a person who naturally bonds with a wide range of visitors and staff at the Museum. While it’s her job to observe visitors and make sure they engage with artwork safely, Rose often goes the extra mile and offers her own special discoveries and insights into the Museum’s collection. Rose has been a gallery attendant at the DMA for only 10 months, but in that time she’s grown very fond of one work of art in particular, The Icebergs by Frederic Edwin Church. About a month ago, during a walk through of the 4th floor galleries, Rose engaged me in a conversation about The Icebergs. She asked us if we’d ever noticed the hidden figures in the painting. Rose excitedly told us about her growing collection of hidden characters in the painting, noting to us that she is continually discovering more as she spends more time with the piece. Two weeks later, I came back to The Icebergs with Rose and asked her to walk me through each hidden figure she’d discovered. Her first discovery was the gorilla. Then one day when the gallery was empty, she took her first “closer look” and the rest snowballed: a mermaid, a mummy, animals, faces in the ice, and many more. With some laughter in her voice she explained to me that when she first began sharing her discoveries with others, they were skeptical of her, but as soon as they could find one figure in the painting they’d be itching to find another. Below are some of my favorites she shared with us (which I’ve outlined in red). What hidden images will you discover when you look closely at The Icebergs? We often think of gallery attendants as people who protect works of art by keeping us from getting too close, but as I’ve learned from Rose, you can “get close” to art in different ways, like absorbing the little details in a painting. Gallery attendants spend a lot of time with our permanent collection, so don’t be shy! Next time you’re exploring our galleries, say hello and ask them what they know. The answers might surprise you! A visitor’s post-it note about Rose left at our Testing Zone, which currently highlights various writing styles for The Icebergs wall text. About four weeks ago, I left my home city of Los Angeles to embark on a new adventure in Dallas. Now, here I am, settled into my McDermott Internship at the Dallas Museum of Art! So, I wanted to share five tips of knowledge gathered in my four weeks of working here. I’m going to be brutally honest with you. I was late on my first day. I had my lame excuses, sure (*ahem* DART) – but nothing is worse than showing up a little pink in the cheeks and frazzled in the mind. Do your research the night before and block time in your first morning schedule for potential mishaps. On my first day as an intern, I met loads and loads of people. They looked smart. They looked professional. They looked like they have been adulting for quite some time now. Even though I may have been the newest fish in the sea, I tried my best to be brave enough to ask my questions and make my shiny and new presence known. You’ll not only look professional but also feel more professional (and thus, confident) knowing that you are dressed to the same par as your (possibly more-adult) peers. 4. Get to know your work environment. Explore your new work-home while it’s still okay to look a little lost and slightly confused. Be aware of your surrounding and make a mental map of it all. Even though this may be one of my first work ventures, I still feel my best when I am being organically me. Thus, I still am me: unfortunate jokes, crafty(ish) desk décor and all. Here’s to many, many more weeks of lessons learned and tips to give! Code-switching – We found lots of evidence of effortless switching back-and-forth between English and Spanish….The power of bilingual text is that it’s bilingual – it provides access in two languages, and code switching lets you understand and express yourself from two different perspectives, with two sets of vocabulary. Facilitation – We researched intergenerational groups, so it’s not surprising that many of the adults saw their role as facilitator as essential to their own and the group’s success in the exhibition….With Spanish labels available, adults were able to facilitate, guiding the conversations and interactions, showing their children, grandchildren, nieces and nephews where to focus and how to interact. Adults who were previously dependent on their children could now take the lead as confident facilitators. Emotional reaction – This study found that the presence of bilingual interpretation had a profound emotional effect on the groups. Groups said they enjoyed the visit more, felt more valued by the institution, and many said having bilingual interpretation changed how they felt about the institution. When I read Yalowitz’s article last year, it opened my eyes to the experiences of non-English speakers in museums with English only text. But the experience was made even more tangible as an English speaker visiting the Museo de Arte de Puerto Rico. Had the text only been in Spanish, I would have had to ask my daughter or significant other to translate for me. This would not have been impossible, but rather inconvenient. If I stopped to look closely at a work of art that they were not interested in, I would have to call them back and interrupt their experience to get assistance understanding the label. Having bilingual text allowed me to take on the role of facilitator, reading the label and prompting my daughter with questions, and allowed my family to switch between Spanish and English comfortably. Furthermore, going beyond bilingual label text and providing bilingual directional signage was significant as well: we were each able to easily and equally participate in the entire museum experience. 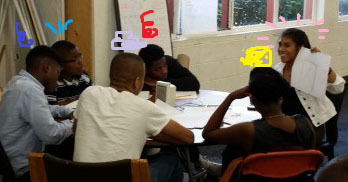 Over the last few years, the Center for Creative Connections (C3) has begun to incorporate bilingual text and voices in a variety of ways. This initiative began soon after the DMA moved to free general admission. With this change in our admission policy, our overall number of visitors and the diversity of those visitors increased. The need for accessible signage for Spanish speakers was apparent, so in late 2012 we started to test out the use of bilingual prompts at the C3 Art Spot. This was the perfect place to start because it is one of the busiest spaces in the Center for Creative Connections. It was also easy to begin using bilingual text in these kinds of prompts because these signs typically change more often and are easier to alter than more permanent wall signage. In 2014, we began to use bilingual activity prompts in the main C3 Gallery as well. This is a prompt for an activity where visitors use a light box and reproductions of works of art from the Museum’s collection to create hybrid creatures. These small steps have been leading up to a bigger change. 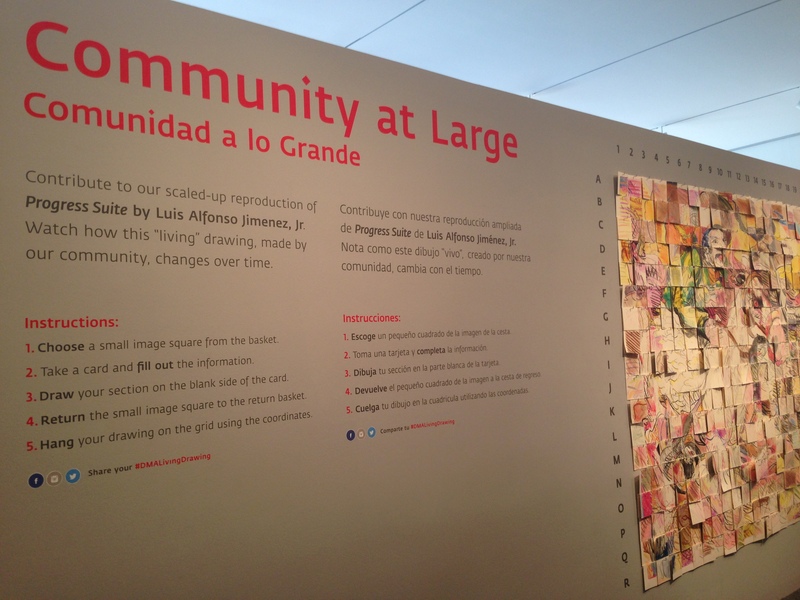 This year when we installed our Community at LARGE project, both English and Spanish text was included not only in the table prompt, but also on the wall text. As we continue to install new works of art in the Center for Creative Connections, our hope is to integrate bilingual text throughout the space.